Educational Qualification : Passed Matric/SSC with full time ITI / Engineering Diploma in Concerned Trades / Disciplines with minimum 60% marks(for SC/ST/PWD min 50% marks Required). 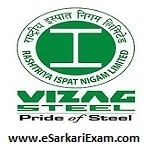 Eligible Candidates can Submit Application at the Official Website of VIZAG Steel latest by 25th September 2018. Click on Junior Trainee Advt No. 6/2018 Link. Open Junior Trainee Advertisement Link. Now Click on New User Registration Link.